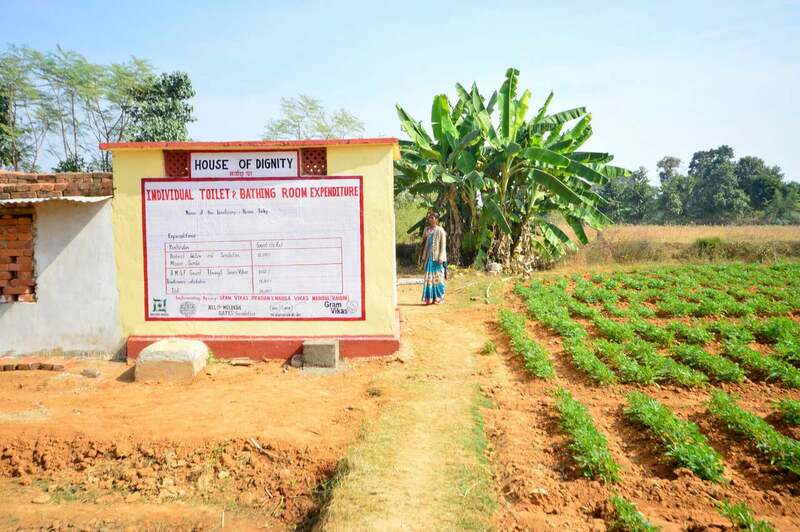 Toilet bathing room unit called ‘House of Dignity’ with a kitchen garden nearby at Raidih block in Gumla district. On 3 February 2017, about 3000 women from the Mahila Vikas Mandal, a federation of women self-help group leaders, from Raidhi block of Gumla district in Jharkhand, marched to the District Collector’s office. Few weeks before, the district administration had passed an order to expedite the construction of household level toilets. The administration was keen to make the block Open Defecation Free by 31 March 2017. Suddenly, the local, private contractors became interested in the construction tenders. But Mahila Vikas Mandal had been working in their villages to construct bathing room and toilet units for all the households for long. The federation has been a partner of PRADAN, Bill & Melinda Gates Foundation and Gram Vikas in the PoWER project. The Partnership for Women’s Empowerment and Rights (PoWER) project aims to establish community-owned and managed piped water supply systems and toilets and bathing room units for every household in 105 villages in Odisha and Jharkhand. Gram Vikas is the socio-technical partner in the programme. Women march to the District Collector’s office to demand their federation’s right to construct toilet-bathing room units. Photograph from Gram Vikas archive. The federation was fully on board with the Prime Minister’s clarion call for Swachh Bharat Mission (SBM). However, unlike the contractors, for these women leaders, the construction of toilets was a gateway to raise awareness, build ownership and ensure sustained health outcomes for the community. “We mobilise the community to contribute money and labour to the programme. Every household constructs a double-door bathroom and toilet unit in their backyard. The community also makes an overhead, elevated water tank to ensure constant water supply to these units. Everyone in the village, whether they are poor or rich, participates. We form the Village Water and Sanitation Committee (VWSC) to monitor the progress. All this takes time.”, says Emelda Lakra, the President of Mahila Vikas Mandal. Women trained as masons constructing toilet bathing room units. Photograph by Dibya Alok. The contractors spread the rumour of the federation collecting money, from the SBM beneficiaries, in the local media and nearby villages. Gram Vikas and PRADAN teams motivated the leaders to own their work and stand up for it. Motivated, by the conviction in their work and the encouragement, the women demanded to the Collector that all work orders for toilet construction in the area be assigned to village organisations. The federation committed to ensuring quality work, the participation of women in planning and monitoring and most importantly, usage. They demanded that the advance subsidy to individual beneficiaries be released immediately so that the work can be smoother and faster. Impressed by the collective strength and reasoning of the women, the District Collector (DC) agreed to all their demands. The DC Office passed a circular stating that the Raidhi will be declared as an ODF block only when there is 100% usage of toilets by the community. The construction was tendered only to village organisations. Further, ₹ 2.8 crores were released as an advance amount with the promise of timely release of money as work progresses. As of November 2018, toilets and bathing rooms have been constructed for 2215 families and the work is in progress for the remaining 211 families in the villages. Water supply provision for other domestic uses. Biswajit Sahu, Cluster Manager of Gumla, with Gram Vikas assisted in data collection for the story. Dibya Alok is a Communications and Social Media specialist at Gram Vikas.